Like many men, I get attached to particular items of clothing. My wife is always complaining about the age of the shirts in my wardrobe, or the colander-like qualities of the jeans I happen to be wearing. That I can fondly identify the culprit for each snag in the denim impresses her not; nor is she sympathetic when told that the splashes of paint on the cuff were honorably achieved in household chores. I'm loath to get rid of these old, comfortable friends. My eventual decision to part with them usually precipitates the sudden appearance of stacks of itchy new shirt with hidden pins or stiff new pants with crinkly pockets. Over the years, I'd taken to keeping my jacket in the trunk of my car so it would be handy if I decided to fly on the spur of the moment. This also had the effect of keeping it out of my wife's sight...until about a month ago. I made the mistake of wearing it home after a flight. "You've got a seam gone in back, and the lining is poking out!" said my wife. I reached behind. Yep, she was right. "The leather is torn all across the sleeves!" Yes, that rather cheap leather had suffered from various little sharp bits sticking out in the Fly Baby cockpit. Little pennants of cheap torn leather hung from the arms. Reluctantly, I agreed it was time for a new jacket. Out came the catalogs, and the order went in for a new A-2. It's been a long, rough, road, since. The jacket that came in had a bit of a color problem. You see, all the flying movies I saw as a kid, the pilots were wearing A-2 jackets that were a medium brown color, with a hint of red. All the A-2s I could find, including the LL Bean one (and the current USAF issue), were a very dark brown. They are OK...I guess...but doggone it, I *wanted* a reddish one. I did a bunch of checking, but only found one that fit the bill...of Kangaroo hide, in fact (US Wings Kangaroo A-2). The trouble was, the jacket sold for almost $500. That wasn't want I wanted to wear while messing around airplanes with a plethora of sharp, pokey parts. I really needed something cheaper. Specifically, their "Leather Connection" catalog. My wife is probably on most of the catalog lists, and we started getting this catalog last year. I had ordered a "brown" A-2 from them earlier this year as a stopgap, but sent it back when it turned out their "brown" A-2 was indistinguishable from black. Recently, we got the Fall/Winter 2005 catalog, and I noticed they had the A-2s in a new color: "Cognac." The small inset picture really made it look like it had the reddish tint I was looking for. The weird thing is: The catalog does NOT have an online presence! They only take orders by phone. Anyway, we ordered the "cognac" jacket, and a week or two later, it arrived. At first, I was a bit dismayed by the color...geeze, it looked TOO light, too red. But then I paged through one of my reference books and found a picture that showed the same hue. leather clothing. I grabbed the new A-2 and a Roscoe patch, and headed over. The picture shows the result...not bad, really. I actually made a bit of a mistake in positioning the Roscoe patch...I laid out the jacket, and started putting the patch centered above the pocket. Even then, I thought the patch looked like it was too far out towards the sleeve. I brought it inboard an inch or so, but really should have brought it in further. The jacket wraps around you as you wear it, and the patch is positioned right at the point where it curves. It doesn't look bad or anything, but it would probably be better to be positioned a bit further inboard and don't worry about whether it's centered over the pocket. So, how much did this all cost? The jacket itself was $109 (free shipping using key code 55305), and the alterations shop charged $10 for sewing on the patch. But what's the jacket like? Well, it looks pretty good. My wife says the leather quality (cowhide) is fairly low. The jackets are made overseas (of course), but the coat came with an inspection sheet that showed where they'd measured the jacket in several dimensions to verify it was properly sized. A nice touch. The jacket has a gloss finish, which makes sliding into and out of the airplane a lot easier. It has snaps on the collar points, so they don't flap in the slipstream, and side-entry pockets in addition the standard flapped ones. The lining of the side-entry pockets are the one thing that does seem cheap...but all I use them for it to stuff my hands in, so even if it tears it shouldn't be a problem. As my wife says, it's a cheap jacket...but at $110, I can probably afford to buy a new one every two years. My last one was a cheapie, too, but it lasted ten years. You can order the Sears Leather Connection catalog by calling 1-800-948-9300. I've already had one admiring comment about the jacket...and one about the Roscoe patch. The vast majority of A-2 replicas are the dark brown color, and this lighter tone really does stand out from the crowd. Actually, there is a bit of controversy about the reddish tint. A lot of people don't seem to believe the jackets actually were this lighter color, originally. One of the best books on the old flying jackets is titled "A-2 and G-1 Flight Jackets: Hell Bent for Leather." 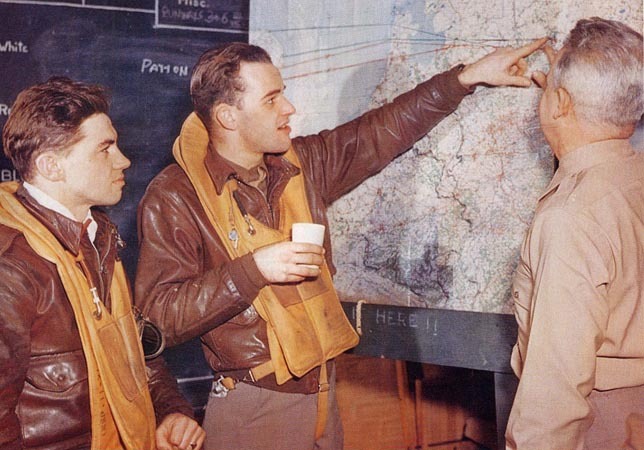 The author tries to basically refute the russet-toned flight jacket issue: "The horsehide was died a rich seal brown, a color defined as a "rich, dark, brown." The MacArthur A-2 in the Norfolk, Virginia MacArthur Foundation museum, however, is distinctly reddish, almost a rusty and light brown, a due that one jacket maker says results from oxidation of the dyes. Dealers who have handled a number of vintage A-2s say that seal brown is a bit "reddish." Part of the answer may be that many original A-2s have dried and faded; furthermore, different sorts of leather accept and retain dyes in varying ways." Yet one page after this appears, the author includes an original WWII Army Air Force color photo that leaves absolutely no doubt that the russet tone ones DID exist...with two pilots standing side-by-side, both wearing identical russet A-2s. ...and the caption reads, "This photo shows the distinctive reddish color of the early A-2s." So the caption writer and the text writer don't really agree. The caption writer accepts that the early A-2s were a russet color, but the author of the main text does not. There are a few more WWII color photos in the book, showing a range from the definite russet of the example above to the dark brown of the current issue jacket. But most seem to have a bit of a reddish tone; few are as dark as what the Air Force has today. It may well be do to a lack of standards during the period the jackets were made. Nowadays there are federal standard color chips, but the jacket makers in 1940 may well have interpreted "seal brown" in a variety of ways. One interesting bit of trivia that my explain my fixation with the reddish tone. After the war, a Hollywood costume shop picked up hundreds of A-2 from military surplus. These jackets were rented out over and over by the film studios, from "Twelve O'Clock High" to "Catch-22." It might be that these jackets were all from a single lot...and that their reddish tone led to my impression that ALL were that color. BTW, by the time "Catch-22" started filming, so many of the movie A-2s had been stolen that extras in the background wore brown-dyed long-sleeve T-shirts. Here's a good trivia question for the next hangar-flying session: When did the Army Air Force quit buying A-2s? Answer: Three months after Pearl Harbor. Still, the AAF had large enough inventory that their stocks lasted another three years.